Travolution Blog: Does the world really need another search engine? Does the world really need another search engine? 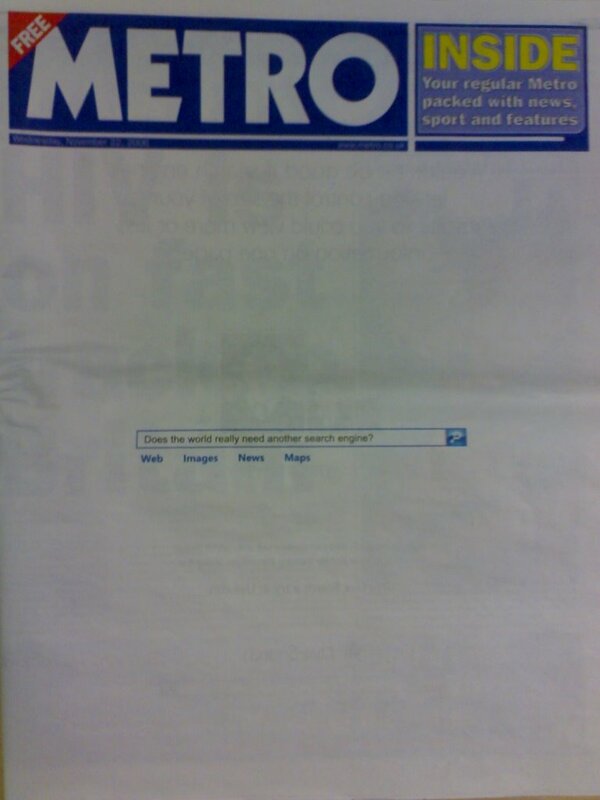 Microsoft clearly thinks so, judging by its efforts today in the UK, where it has taken out a – not cheap by any means – four-page cover-wrap of the Metro newspaper. The marketing push for the Live.com engine has now started in earnest, ahead of what is expected to be a pivotal year in 2007 for Microsoft with the launch of the Vista operating system, the upgraded Office suite. And how much emphasis is Microsoft putting on the Web 2.0 functionality of its product? must've cost 'em a fortune! 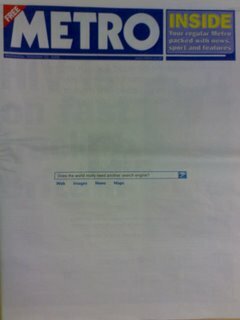 Shame nobody will remember the website address because as far as I can see most commuters dump their papers on the Underground. oops. Darren's got a point. But when it comes to branding rather than direct response, even the likes of Microsoft would acknowledge that print is going to beat online every time.